Every day I start out wondering if there will be any new things to photograph. Or just more beautiful ocean, big mountains and curly-horned cows with bells...? But of course there are! Today my first photograph is of a row of sidra (cider) barrels- these are quite small ones; the large ones are about 2m diameter. 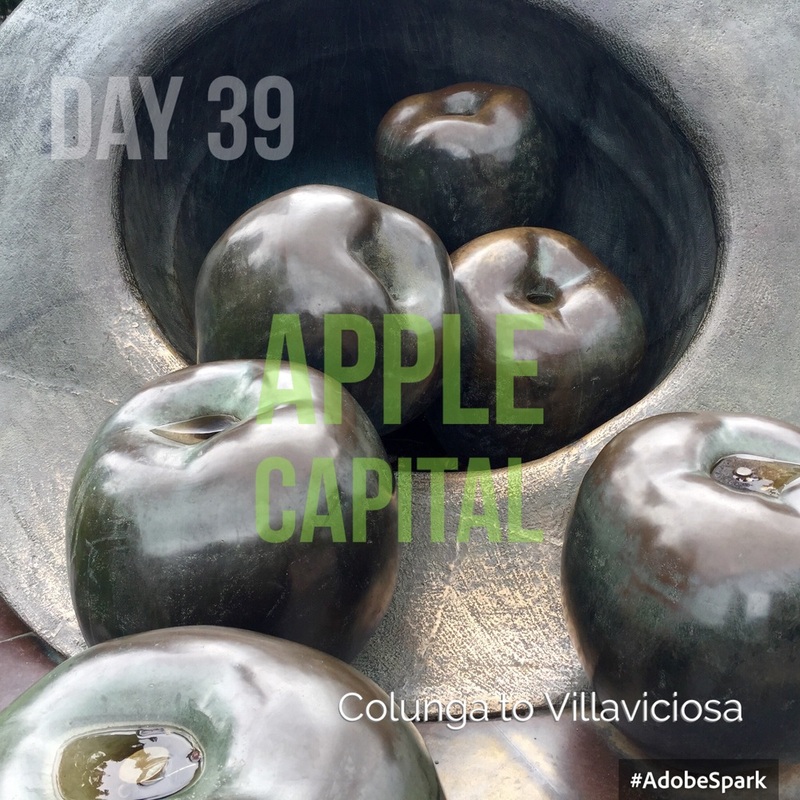 Esturias is the cider area and the town of Villaviciosa is the cider capital. Agriculture along the Camino is traditional; small herds of beef cows with plenty of free-range bulls!, scattered apple orchards, flowery hay meadows and allotment sized vegetable gardens. It's a lovely change to the intensive mono-culture and manicured landscape across most of the UK. Rebecca and I set out from Colunga in gaiters; it's going to be a wet day. The 'Red Hunchback' (poncho) had another outing and I've discovered a popper which lifts it up to knee level and creates more ventilation while keeping dry. Some pilgrims ahead are walking with umbrellas. 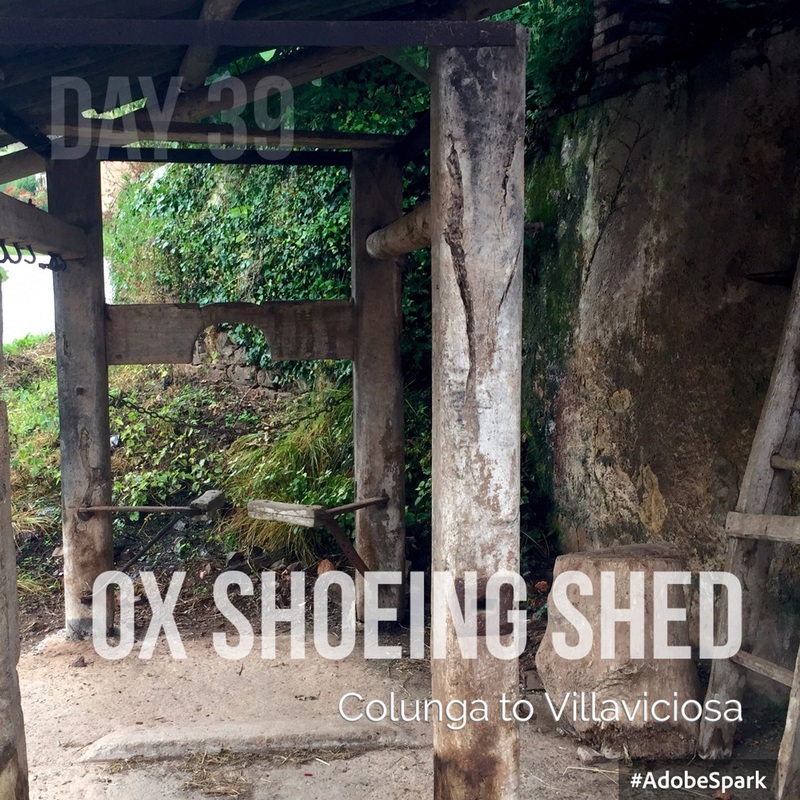 We walk mainly through woods and at La Vega come across an ox-shoeing shed. Rebecca being a farrier knew that oxen can't stand on 3 legs and need to be hoisted off the ground to be shod with cloven shoes! There are plenty of ups (200m) and downs! We avoid muddy paths by walking on the roads and logging tracks most of the time, but eventually the clouds part and blue skies arrive at midday. There is an albergue at Sebrayo which we try to book into, but no one is at home, so we carry on following the river estuary to Villaviciosa. On the outskirts we walk beside an enormous cider factory and when we get to the front gate discover there is a tasting-bar and shop!! Hurrah! The lady tending the shop doesn't have many pilgrims popping-in, so we tasted (drunk) most of a bottle of cider-champagne. This is similar to English cider; refined, sweet and fizzy and just right after a 12 mile hike in the rain. The name of the brand is 'El Gaitero' which means The Piper; the bagpipes are the regional instrument now that we are in or near a Celtic province. Villaviciosa has a interesting 'Old Town' with a Franciscan college reminiscent of a Spanish Mission and a 12th century church, with a carved portal and a serene and simple interior. The private albergue here is new and well appointed. Each room has its own shower, hair dryer and WC and every bed has 2 electric plugs (for charging your phone), a little shelf to put your ear-plugs on and an individual light. There are even boot dryers. All very well thought by former pilgrims! Rebecca is traveling by bus to Oviedo tomorrow, so we go out for a last 'Menu del Dia'. She has a stocky Basque physique and wears browns, greens and navy; I'll miss her practical earthy, groundedness and our conversations. She has kindly shared some of the readings that her family and friends have written in a book for her to travel with: HERE, BODY, HALFWAY and FOOLISHNNESS. The Camino has given me some very special companions along its Way. Thank you. I am now 349km from Santiago. Villaviciosa is the sidra capital.